Dentists Keep Dying Of This Deadly Lung Disease. The CDC Can't Figure Out Why. The dental professionals were 23 times more likely to have IPF than the rest of the population, the CDC said in a report. Dental professionals were 23 times more likely to have IPF than the rest of the population. Seven of the patients were dead, and two more were dying of a rare chronic, progressive lung disease that can be treated but not cured. It's estimated that about 200,000 people in the United States have Idiopathic Pulmonary Fibrosis (IPF) at any one time. But the common denominator of a small group of patients at a Virginia clinic over a 15-year period is worrying the Centers for Disease Control: Eight were dentists; a ninth was a dental technician. The dental professionals were 23 times more likely to have IPF than the rest of the population, the CDC said in its Morbidity and Mortality Weekly Report, released on Friday. Something in their workplace environment may have been poisoning them, investigators said, although they don't know what. IPF causes scarring of the lungs, according to the report. It can be slowed, but nothing can remove the scar tissue. Over time, the lungs have difficulty getting oxygen to vital organs like the heart and brain. In April, 2016, a Virginia dentist who had just been diagnosed with IPF and was undergoing treatment at a specialty clinic called the CDC with a warning: Several other dental professionals had sought treatment at the same facility. Investigators dug deeper, poring over nearly 900 records of IPF patients at that clinic over a 21-year period and found the nine patients with the common work history. The median survival age of IPF after diagnosis is three to five years. But first, patients experience shortness of breath, a dry, chronic cough, weight loss, joint and muscle pain and clubbed fingers or toes. Dentists and people who work in their offices are exposed to a specific set of hazards, particularly silica, polyvinyl siloxane, alginate and other toxic substances that can be inhaled when they're polishing dental appliances or preparing amalgams. 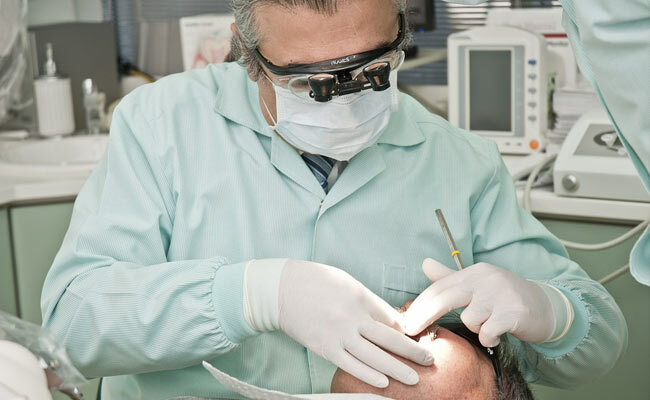 Older dentists usually fare worse, both because of increased opportunities for exposure and because they may have practiced at a time when safety standards weren't as stringent. "We do work with materials and with human bioproducts that are potentially damaging to our bodies if we inhale them," Paul Casamassimo, chief policy officer of the American Academy of Pediatric Dentistry's Pediatric Oral Health & Research Center, told CNN. For example, the dentist who alerted the CDC never smoked, "but reported not wearing a National Institute for Occupational Safety and Health-certified respirator during dental activities throughout his 40-year dental practice," the CDC said. During the past 20 years, he started wearing a surgical mask, which still may have been inadequate. "More work has to be done before we can make any conclusions about the risk dentists or other dental personnel have," Randall J. Nett, lead author of the study and medical officer with the U.S. Public Health Service, told CNN. Even though CDC investigators have not figured out what, specifically, caused IPF in the patients, the study's release may still do some good. Before, workers exposed to dust from wood and metal have been warned to take precautions to prevent IPF, but this is the first time the CDC has warned that dentists and the people who work in their offices are vulnerable. And IPF may not have a cure, but there are protective measures: namely proper ventilation and wearing a respirator during certain procedures.